6 EL TEATRO DE ZAPATA.. EL ESPEJO DEL ---PUEBLO--- El Teatro Chicano has proved to be effective as a tool to create a true mirror for La Raza. Recently "El Teatro de Zapata" has performed at Hutchinson Community college in Kansas for MECHA's Chicano Awarness Conference. Which was held on Feb. 23rd and 24. On Friday the 23th el Teatro performed for la Raza at a dance held at the G.I. Forum Club. La Raza responded well and enjoyed the performance a great deal. El Teatro had a great time getting it together con los carnales y carnalas en Kansas. On Saturday the 24th el Teatro performed twice at the auditorium of Hutchinson College. The occasion ended with a baile a muy de aquellas and the band from Ablene, Texas that played, named "Chicano Power", lived up to it's name. El Teatro also had a successful presentation for the Chicano high school students from Iowa. They keyhole Committee from the University of Iowa and the Chicano Indian American Center sponsored the visitation program on march 3rd and 4th. The experience received by both, high school and college students was worth the effort. El Teatro was very busy that same Saturday, the 4th, because after the performance in the afternoon,the Teatro left for Davenport to performa gain. 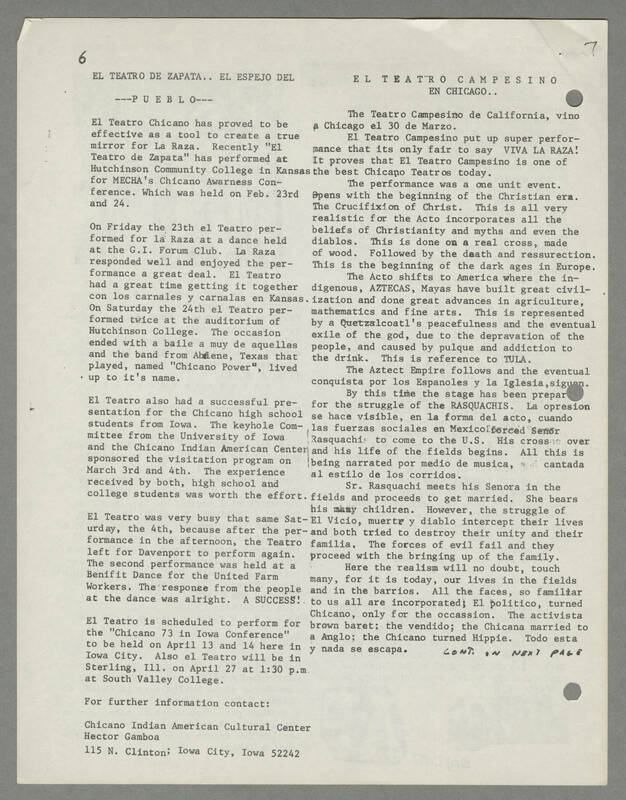 The second performance was held at a Benifit Dance for the United Farm Workers. The response from the people at the dance was alright. A SUCCESS! El Teatro is scheduled to perform for the "Chicano 73 in Iowa Conference" to be held on April 13 and 14 here in Iowa City. Also el Teatro will be in Sterling, Ill. on April 27 at 1:30 p.m. at South Valley College. For further information contact: Chicano Indian American Cultural Center Hector Gamboa 115 N. Clinton; Iowa City, Iowa 52242 EL TEATRO CAMPESINO EN CHICAO.. The Teatro Capesino de California, vino a Chicago el 30 de Marzo. El Teatro Capesino put up super performance that its only fair to say VIVA LA RAZA! It proves that El Teatro Campesino is one of the best Chicano Teatros today. The performance was a one unit event. Opens with the beginning of the Christian era. The Crucifixion of Christ. This is all very realistic for the Acto incorporates all the beliefs of Christianity and myths and even the diablos. This is done on a real cross, made of wood. Followed by the death and ressurection. This is the beginning of the dark ages in Europe. The Acto shifts to America where the indigenous, AZTECAS, Mayas have built great civilization and done great advances in agriculture, mathematics and fine arts. This is represented by a Quetzalcoatl's peacefulness and the eventual exile of the god, due to the depravation of the people, and caused by pulque and addiction to the drink. This is reference to TULA. The Aztect Empire follows and the eventual conquista por los Espanoles y la Iglesia, siguan(?). By this time the stage has been prepared for the struggle of the RASQUACHIS. La opresion se hace visible, en la forma del acto, cuando las fuerzas sociales en Mexico forced Senor Rasquachis to come to the U.S. His cross over and his life of the fields begins. All this is being narrated por medio de musica, cantada al estilo de los corridos. Sr. Rasquachi meets his Senora in the fields and proceeds to get married. She bears his many children. However, the struggle of El Vicio, muerte y diablo intercept their lives and both tried to destroy their unity and their familia. The forces of evil fail and they proceed with the bringing up of the family. Here the realism will no doubt, touch many, for it is today, our lives in the fields and in the barrios. All the faces, so familiar to us all are incorporated; El politico, turned Chicano, only for the occasion. The activista brown baret; the vendido; the Chicana married to a Anglo; the Chicano turned Hippie. Tod esta y nada se escapa. CONT IN NEXT PAGE.